Recently I restored and repaired a Walnut Eastlake Chair. I put a date of 1875 on this chair but in truth chairs like this were made throughout the United States for most of the second half of the 19th century. 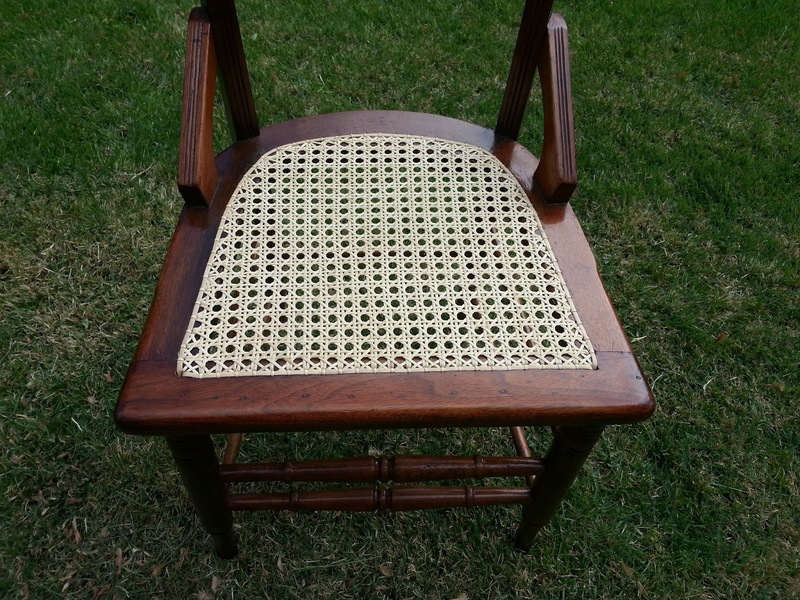 It is probably from the fourth quarter of that century and has design characteristics that are associated with the American form of the Eastlake Movement. A search of the label Eastlake on this blog will shed more light on that movement. I have written about and repaired chairs like this in the past but I thought this one was interesting especially because of the repair. 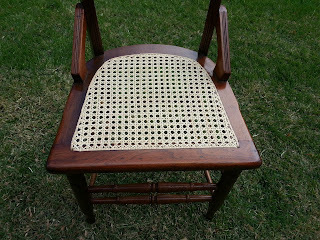 The seat is made from hand woven cane which is woven into a Walnut seat frame. 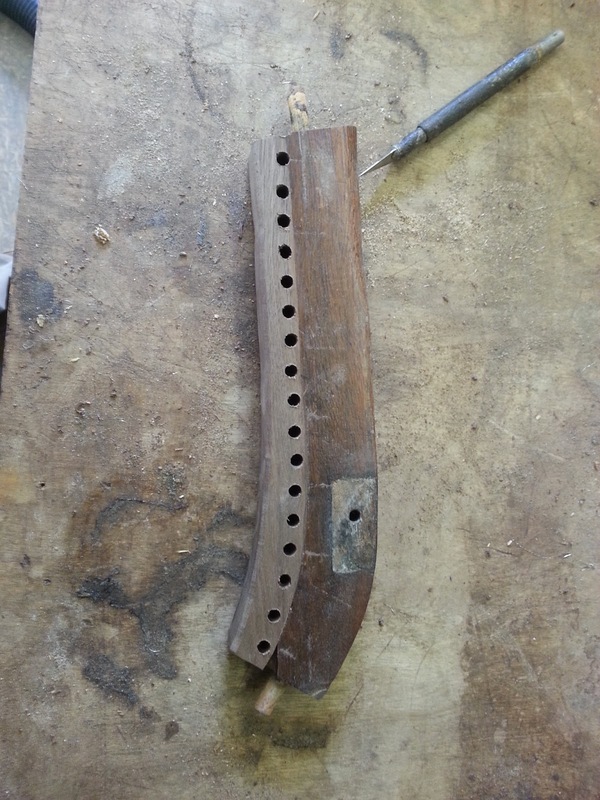 The left side of the frame (facing) had broken along the perforations made for the cane to pass through, which are the weakest part of the frame. The common repair for this is to glue the broken piece on and screw it as well between the perforations. 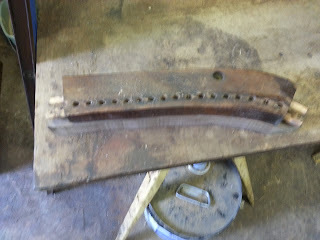 This repair works for the short term but more often than not I have seen it fail again after a few years. I decided to try another approach which I have outlined below. 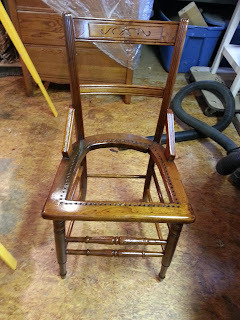 But first, a few photos of the chair as it came into the shop. 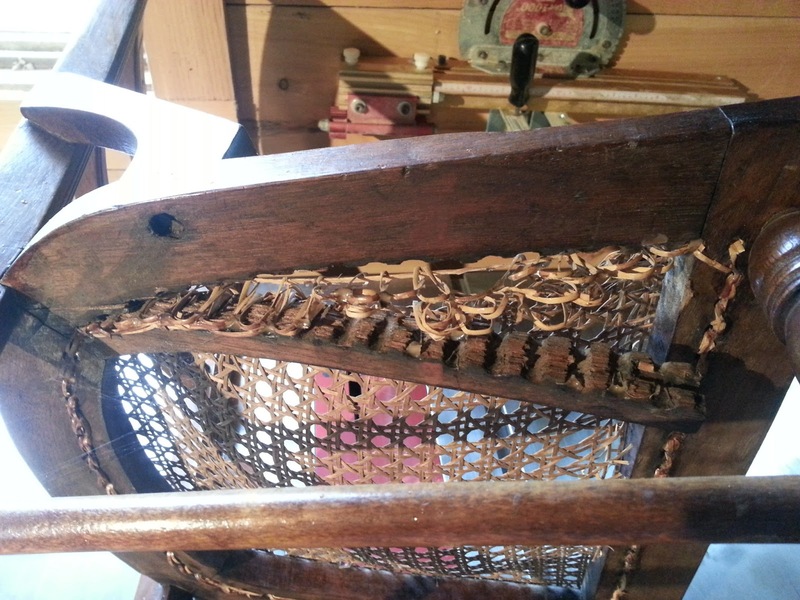 This photo shows the damage to the seat frame from below. 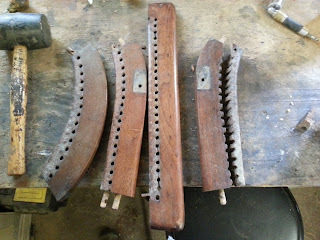 The first step was to remove the seat frame and the loose components of the chair for repair and gluing. 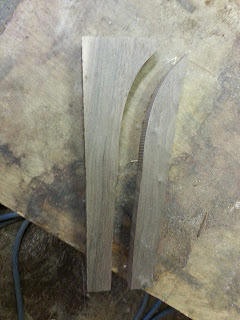 The front stretcher had a crack in it which separated completely. 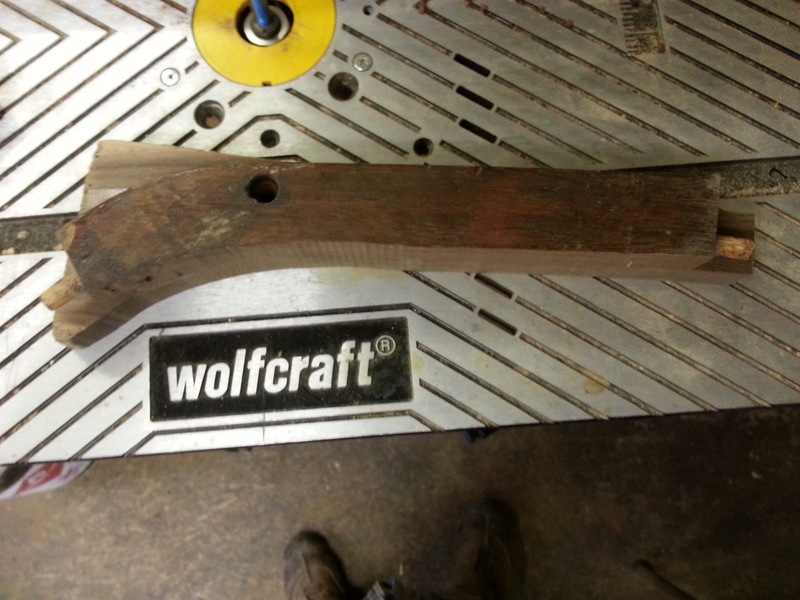 This photo below shows that stretcher being repaired. 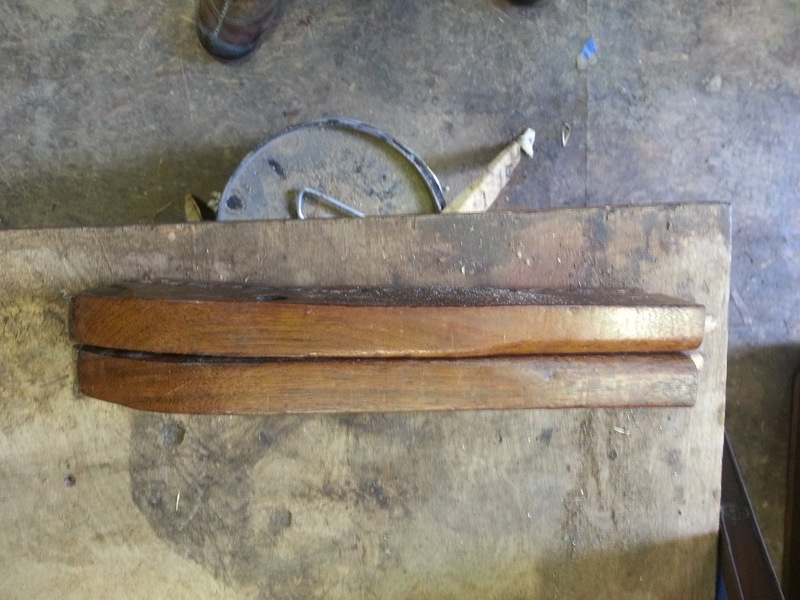 This photo shows the seat frame removed from the chair. 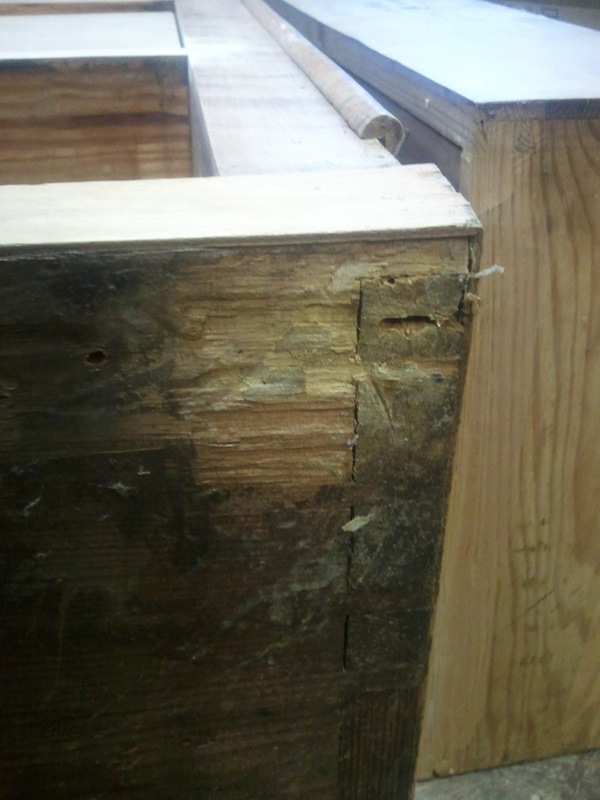 The broken portion has been removed from the frame on the left. 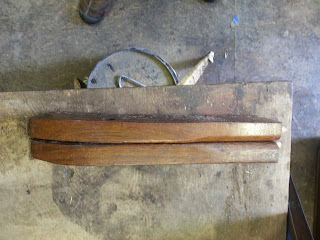 The individual components of the seat frame are seen knocked apart here with the broken piece on the right. 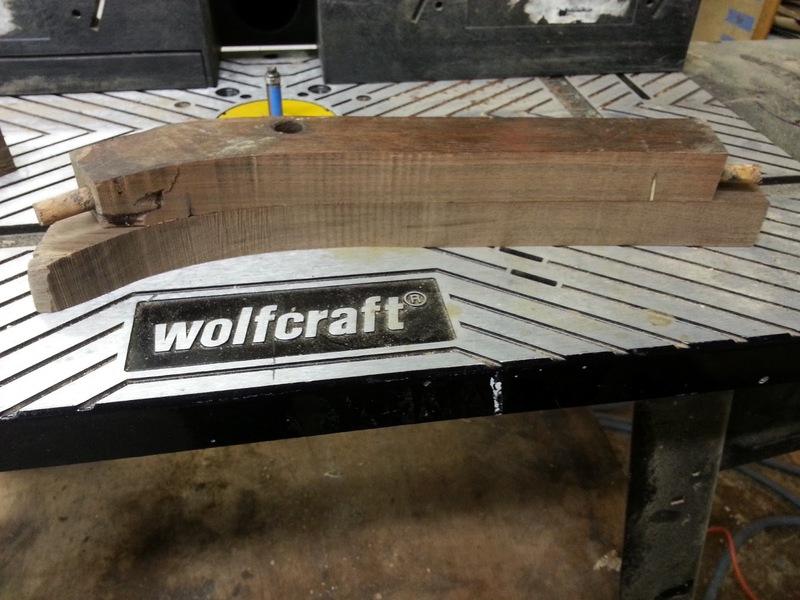 I used a new piece of Walnut to patch the broken section. 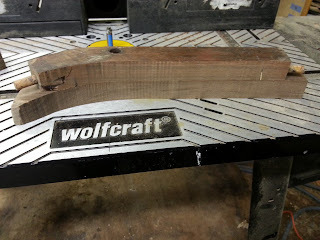 The idea was to glue a new piece of Walnut on to the seat frame, but to cut the seat frame back beyond the perforations so that I would have a good solid surface to glue to . 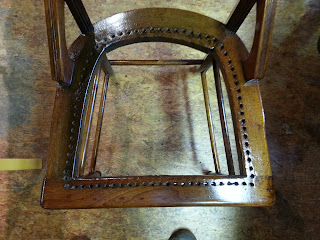 The new piece would have all of the perforations in it which I would drill at the end to match the originals. 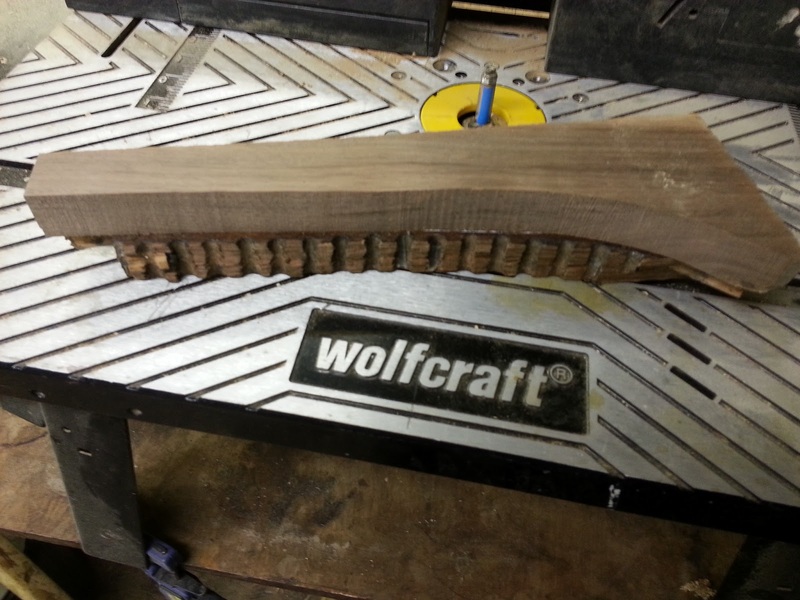 The new Walnut piece I started off with is seen below. 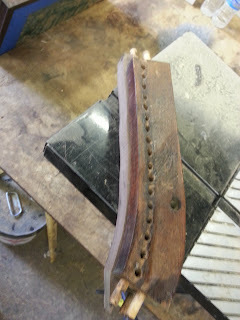 I followed the general out line of the break on the seat frame and moved it back so that it would completely clear the perforations. 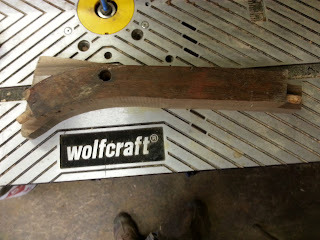 This curve was cut to the shape of the seat, but it was cut freehand. The two sections can be seen below after the cut. Using double sided tape, I adhered the part that I would late discard from the patch to the top of the broken frame component to be used a s a template. This can be seen below. Using a pattern bit on the router table (the pattern bit can be seen behind the wood. It is blue!) 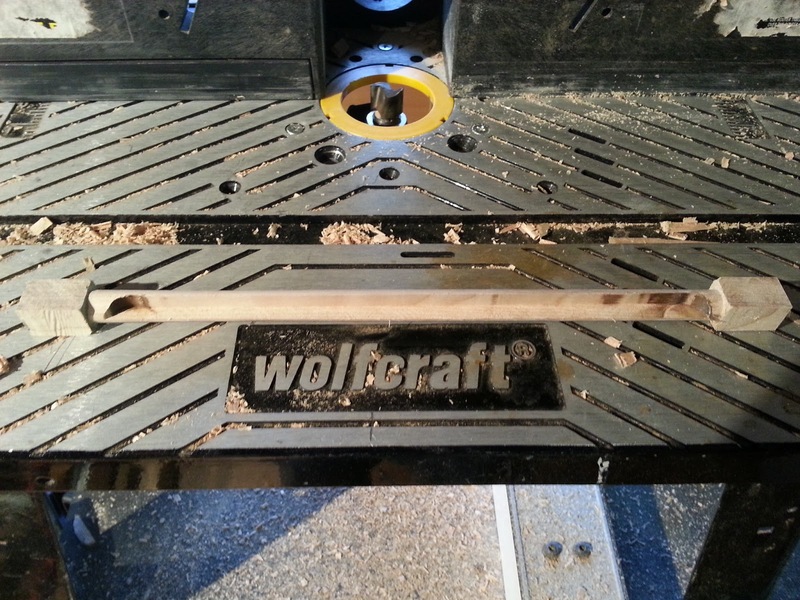 I routed the seat component so that the curve was identical to the unused portion of the patch. 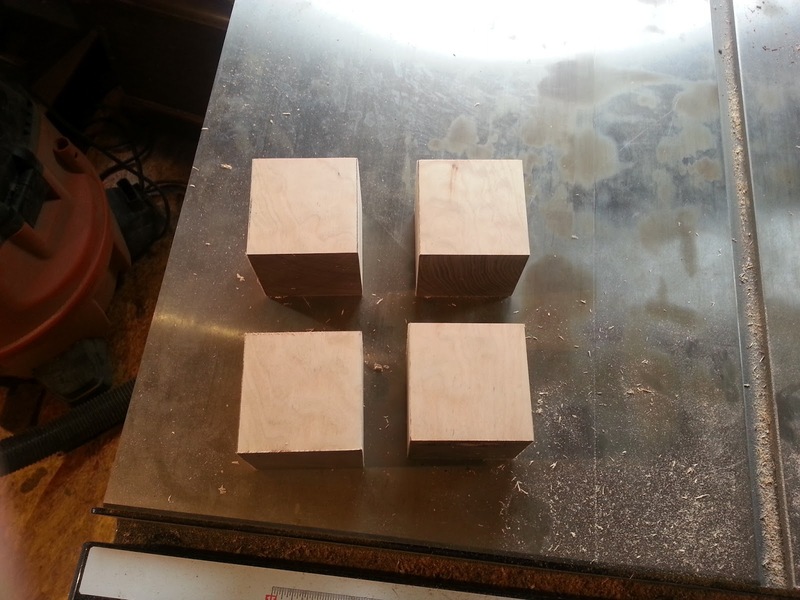 After this was done I separated the two pieces and threw away the new wood. The two pieces can be seen in the two photos below. 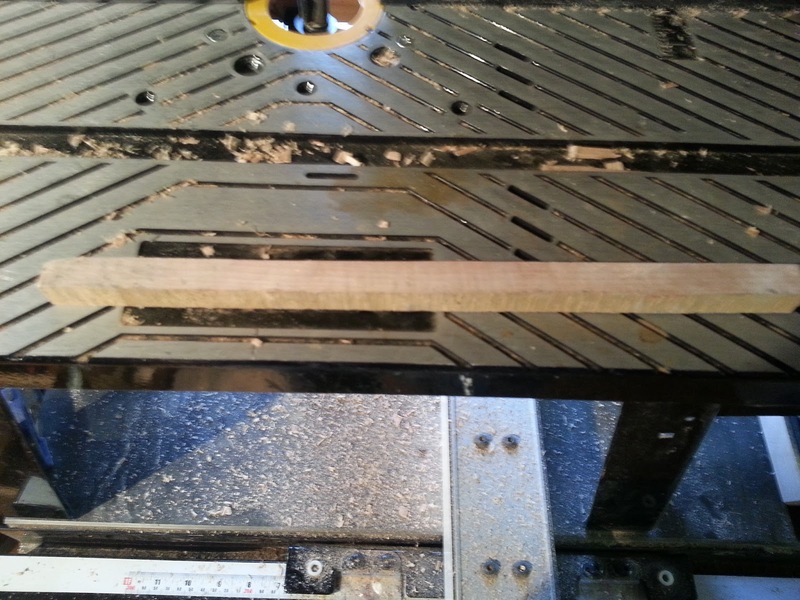 The curve that was cut matches exactly. 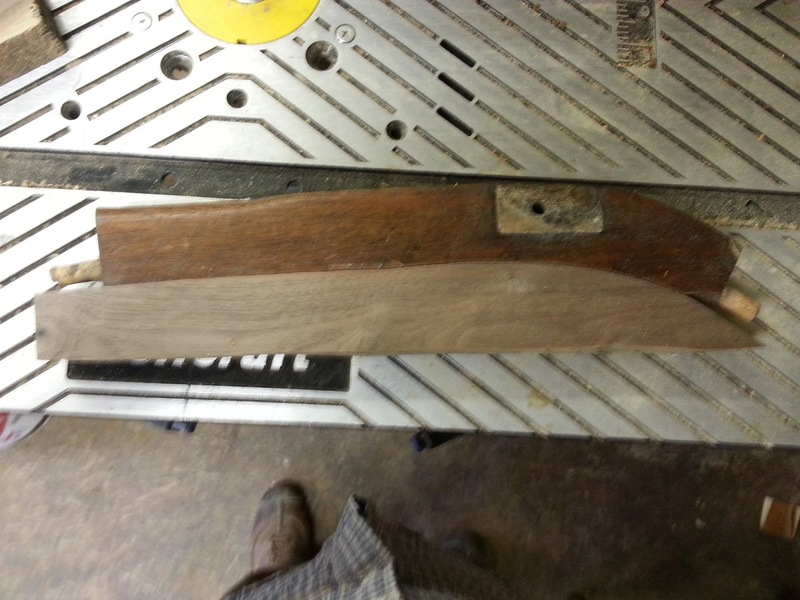 The portion of the new wood that was intended to be used as the patch now fit the old wood perfectly. 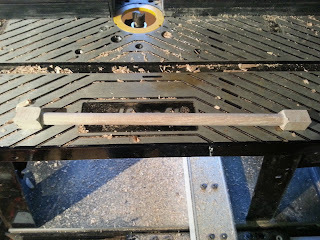 The seat frame and the patch can be seen test fitted below. This photo shows the patch being glued to the old seat frame. The two pieces adhered after the glue had dried. 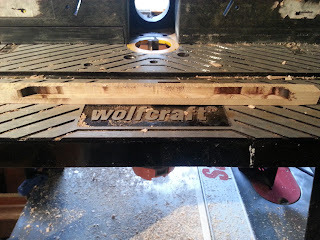 Once the patch was glued in place, I then used the component from the opposite side of the seat upside down as a template to cut the inner curve of the patch. This can be seen below in the next two photos. 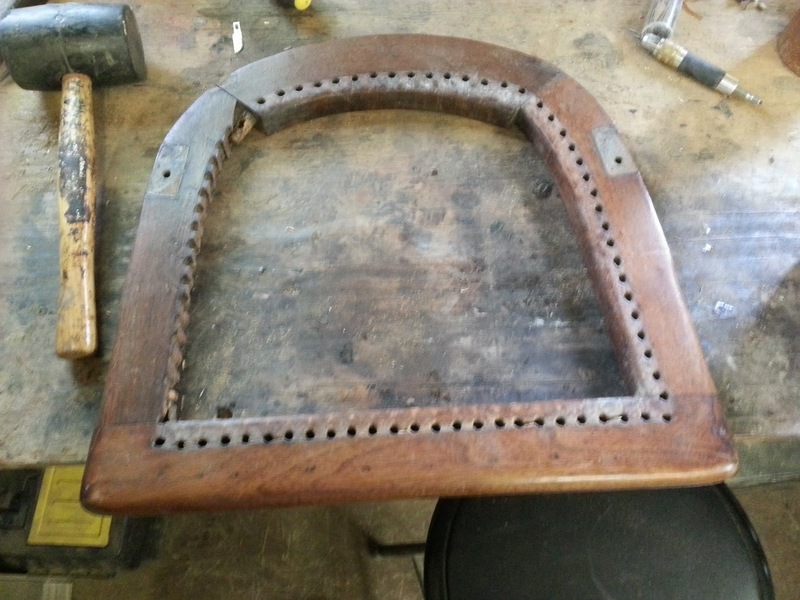 This next photo shows the patch with the inner curve cut to match the inside of the original. I was also able to copy the spacing for the perforations onto the new wood while the two sections were adhered with tape. The completed patch. 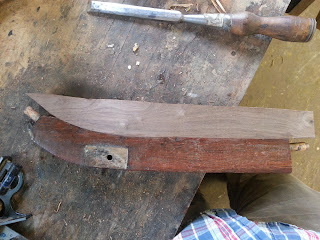 One last detail was to round the inside edge of the patch so that it would not be sharp against the new cane. 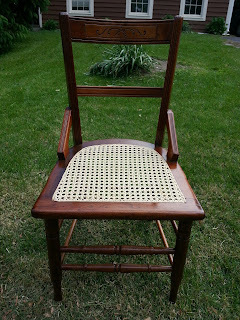 This photo shows the chair after it was reassembled. The patch is on the left and is touched up so that it matches the original finish on the seat frame. The following photo is a of the seat frame in detail. 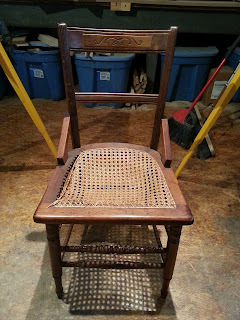 These last three photos show the completed chair with a new woven cane seat. 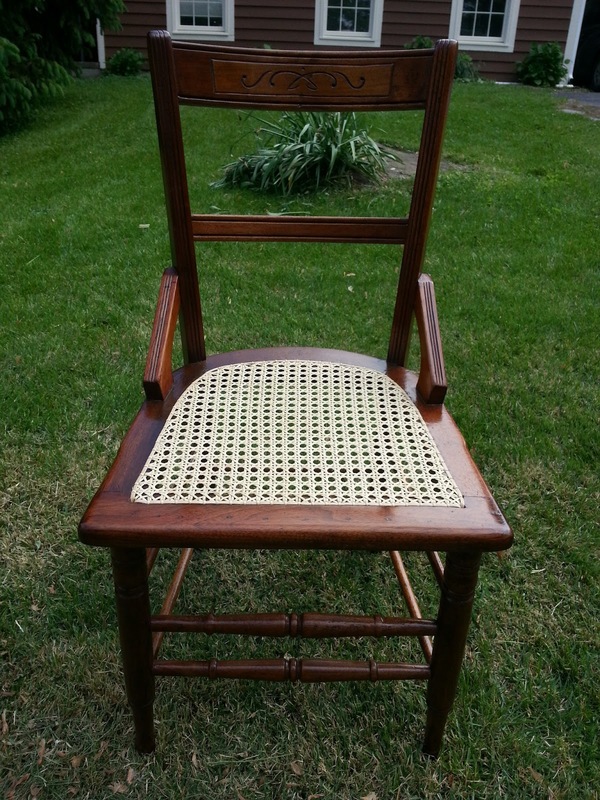 When I picked up this chair from Chris Frear, my caner, she informed me that she was going to be retiring from chair caning from here on out. I would like to take this opportunity to thank Chris for all of the beautiful work she has done over the years for me and the rest of the local community. She always gave me a perfect new seat and she did so with a smile on her face! Thank you, Chris! A recent project in the shop was the restoration of a Biedermeier Secretaire a Abattant, or Biedermeier secretary desk. The name sounds a little confusing, since the first word is German followed by French( and none of this in English!) The reason I chose to start of this way is to point out that while the piece comes from Germany or Austria, in a style is known as Biedermeier, The form of the Secretaire a Abattant (literally Flap Secretary) originated in France. This form is not only seen in 19th century French Furnishings, but also in English, German, and American. The American name for this form is a fall front desk or a drop front desk. The spread of this form to the various countries occurred during the early part of the 19th century in what is known as the Empire period in France. 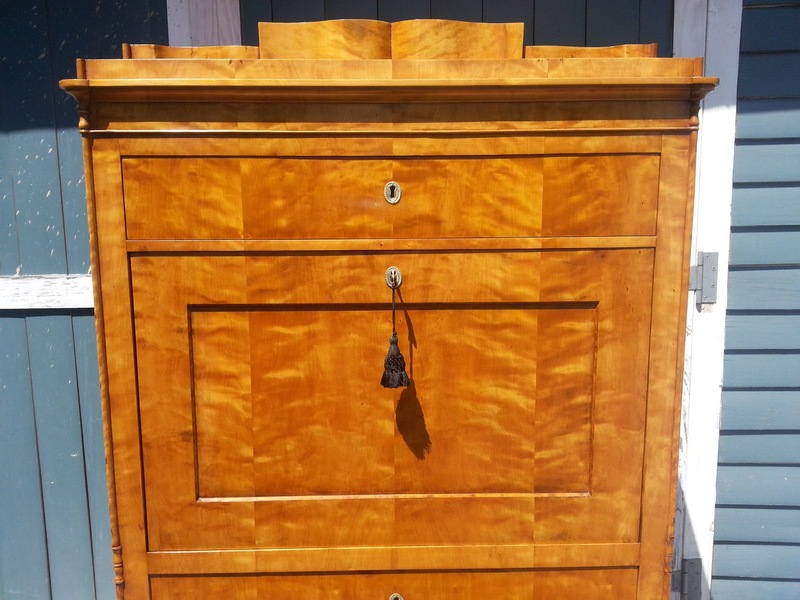 As these designs were taken in by the cabinetmakers of the various countries, the form was incorporated and vernacular designs using local woods were created. This was the case in northern Europe as well as in America, where the style is known as American Empire, or Late Classical. In northern Europe, the style came to be known as Biedermeier. The Biedermeier period refers to the time period between the Congress of Vienna in 1815 and the Revolution of Germany in 1848. This time saw the rise of the middle class in Germany and Austria and with it a demand for furnishings that were contemporary, stylish, and affordable. A style that, like other neoclassical forms was new and independent of the furnishings that came before. 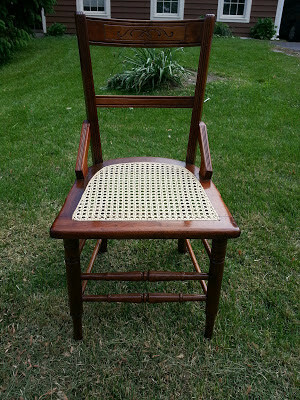 the name "Biedermeier" comes form an amalgamation of two satirical characters from poetry by Josef Viktor von Scheffel. Their names were Biedermann and Bummelmaier. The publisher Ludwig Eichrodt combined the names to make "Biedermaier" and later "Beidermeier". This name later came to characterize the art and furnishings centered in Germany during the first half of the 19th century. It is important to recognize this as an independent style, and not simply a sub-genre of the French Empire. Once investigated, it is clear to see that Beidermeier is a distinct style with unique characteristics and fundamental differences from the earlier Empire style. 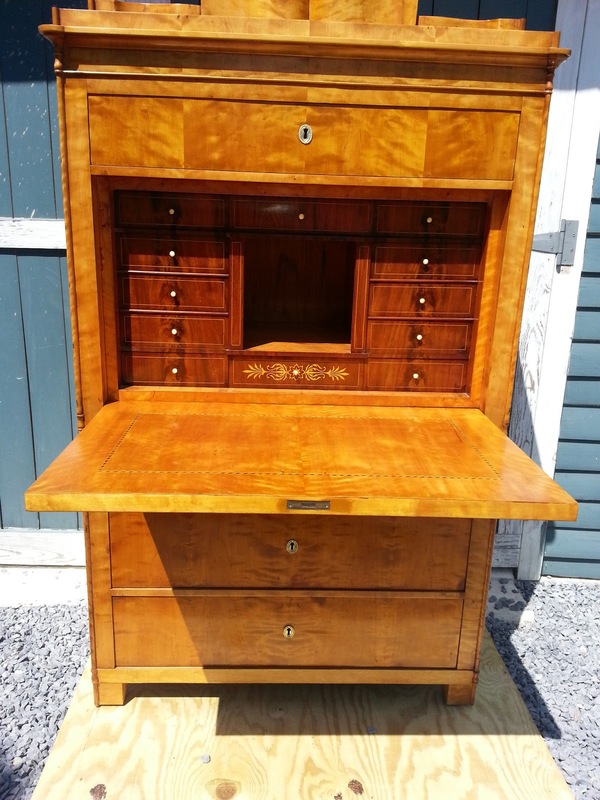 After looking at many examples of Biedermeier secretary desks, I believe that this particular desk originated in Austria. The closest examples that I could find which echoed the style and ornamental features of this piece seem to have come from Austria. That being said, I saw many examples that while differing in design, used similar woods.These examples seemed to hail from Northern Germany. 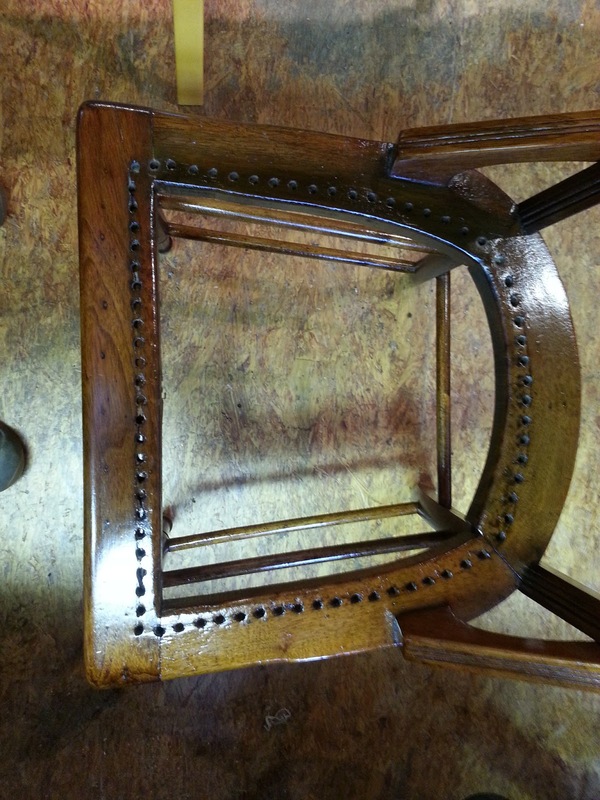 One of the hardest parts of identifying the origin of these pieces is that there is an enormous variety of designs and design elements employed in the making of these desks. 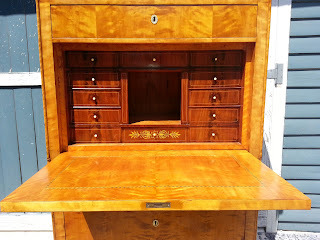 A quick search of Google images for Biedermeier desks will show what I mean! 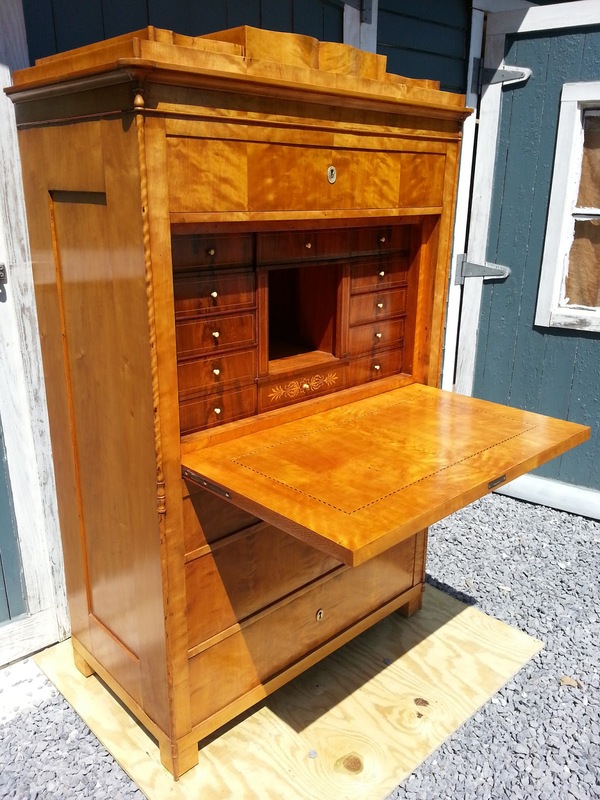 One of the reasons for this diversity in design was that these desks served as a signature piece for cabinetmakers and they would put all they had into their design and construction. 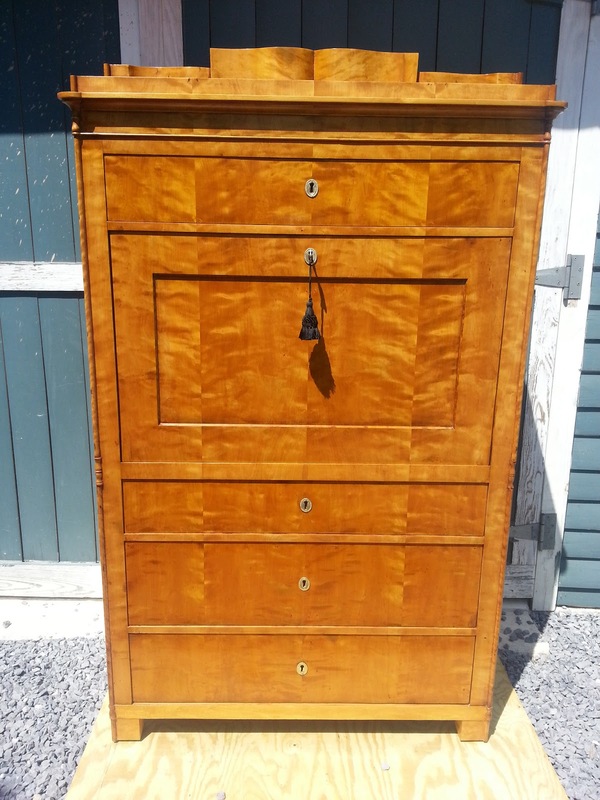 This is because the Secretaire figured prominently into the German household. It served as a place to store and lock valuables but also as an imposing statement in the decoration of the room. In most cases, this would be the largest piece in the room, if not the household. To add to that, the tiered top of the desk was used as a place to display busts or flowers. 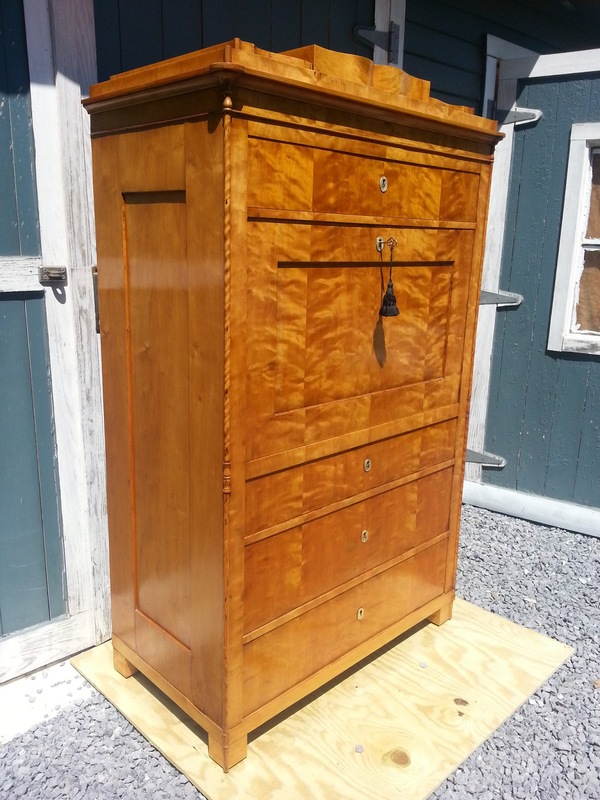 In short, this was a piece that was made to be seen and the cabinetmaker used this fact as a way of displaying his craft. Now to the desk itself. 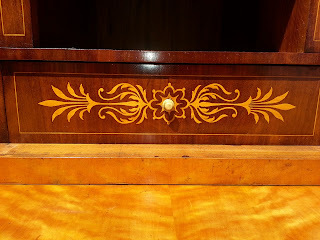 The outer surfaces of the desk are veneered entirely out of flame Birch which was arranged in repeating bookmatched patterns. The edges of the front of the desk had a 3/4 column of turned flame Birch attached from top to bottom. 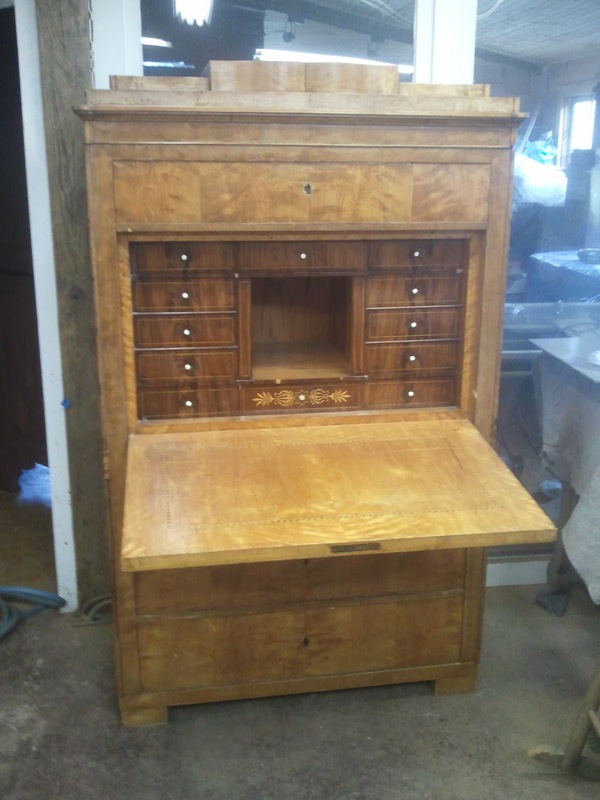 The desk was arranged with one long drawer at the top. 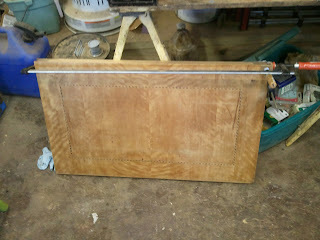 Beneath this was the drop front which serves as a door as well as a writing surface. 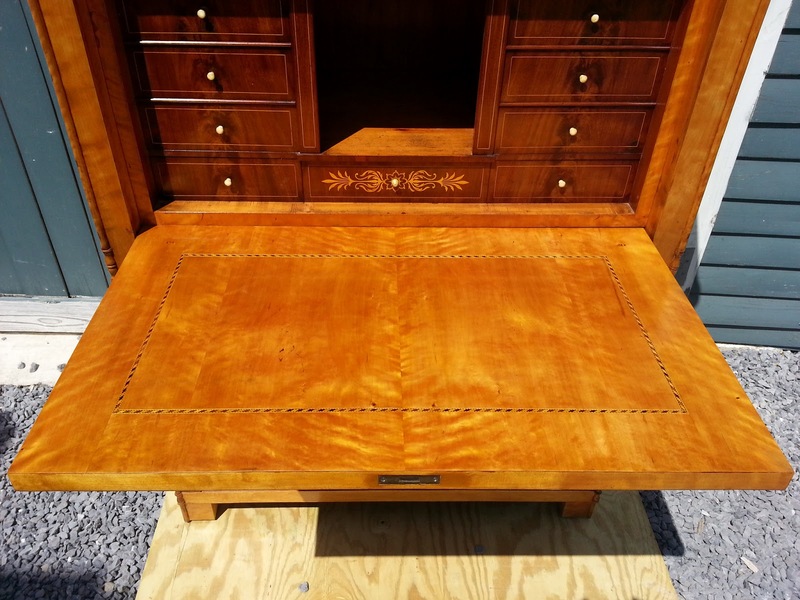 The interior of this large compartment houses several smaller drawers which are veneered with crotch Mahogany. The pulls on all of these drawers are turned Ivory. 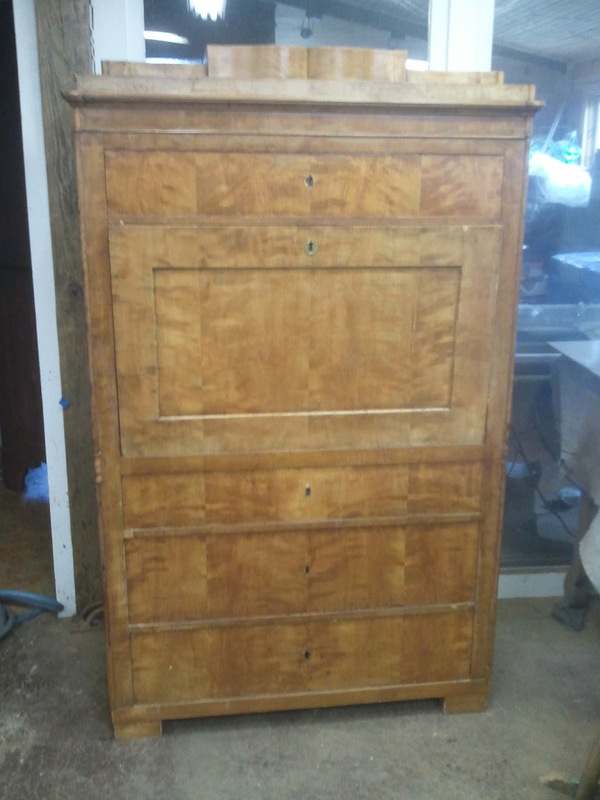 Beneath the desk compartment are three additional long drawers, which are graduated. 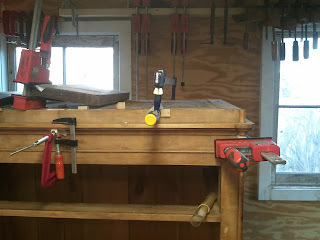 An interesting feature of these desks is that while the drawers are graduated, they are mixed and do not have an order, like smallest at the top and deepest at the bottom. What purpose this may have served is a mystery to me, but perhaps it was a style feature. 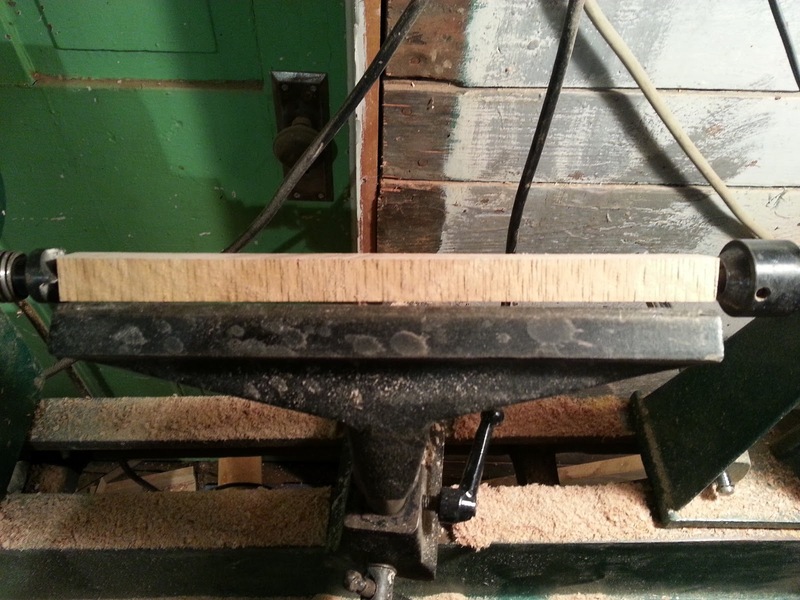 It seems to be fairly consistent in Biedermeier desks. 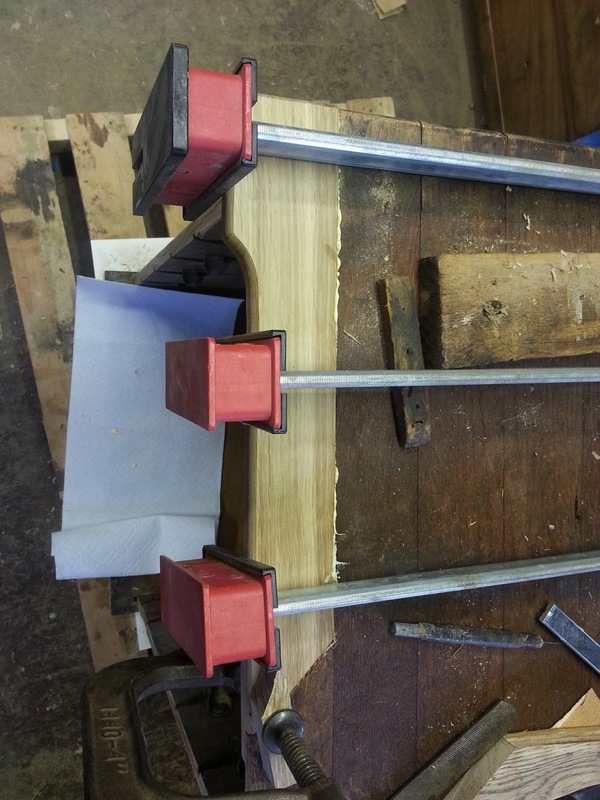 The desk was beautifully constructed using tight hand cut joinery. The secondary wood that the case was made of is Pine and the piece shows no sign of having been made with machinery. Below are a few photos of the desk as it came to the shop. 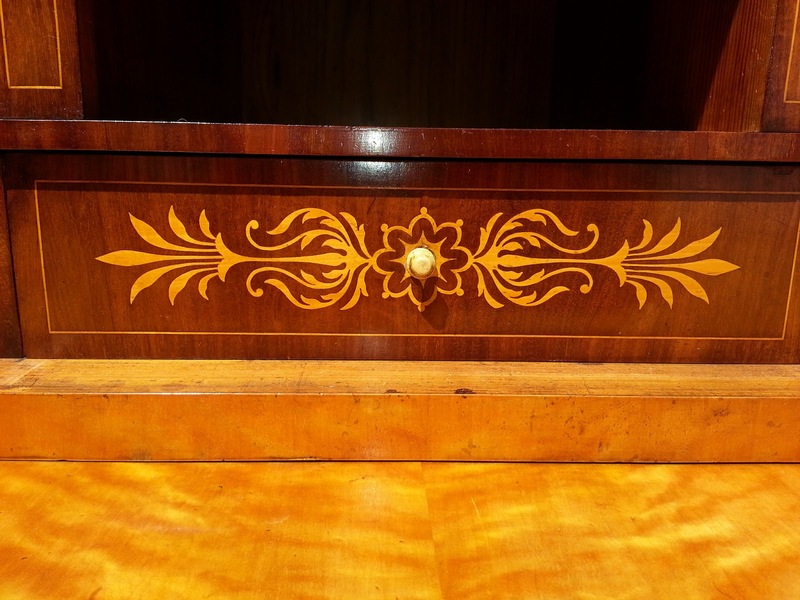 The lower central drawer displays Boulle work inlay in a contrasting wood, perhaps Birch or Maple. 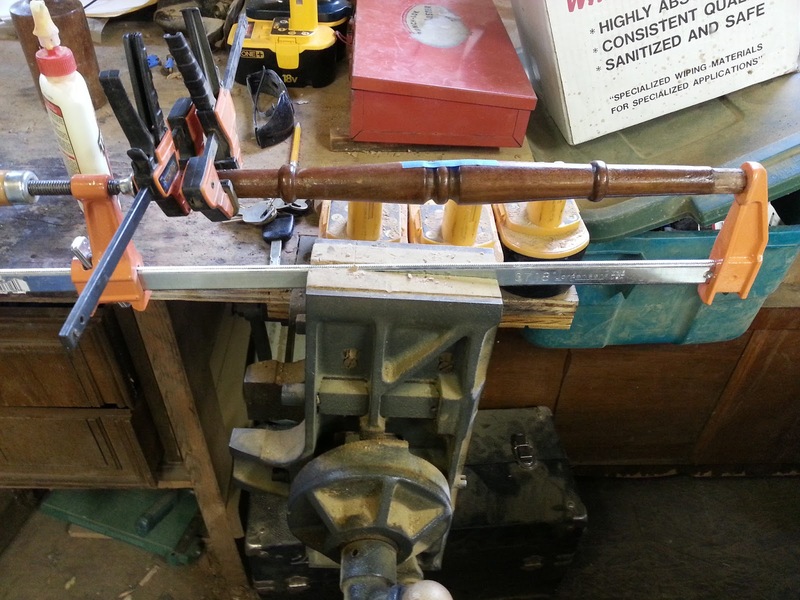 The piece had a long list of repairs that were necessary. 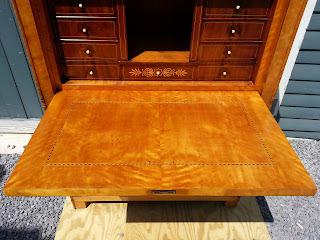 This included a new finish, lots of veneer repair, Replacement of the inappropriate feet, repairing the desk lid so it opened and closed properly, and repairing the drawers and the drawer locks. In essence, this piece needed a bit of everything! 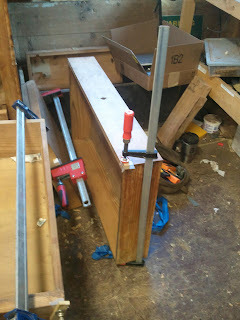 Before getting into the repairs, I will share what we did discover about the desk while working on it. 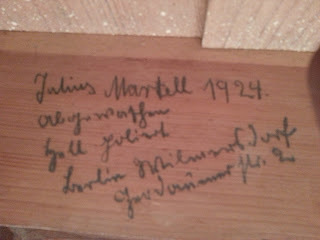 The desk was signed by the cabinetmaker, whose last name was MÜLLER. The handwriting of this signature matches the numbers written on the underside of the compartment drawers. 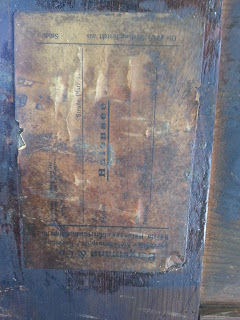 This appears to be the earliest handwritting on the piece. Below is a photo of the signature. 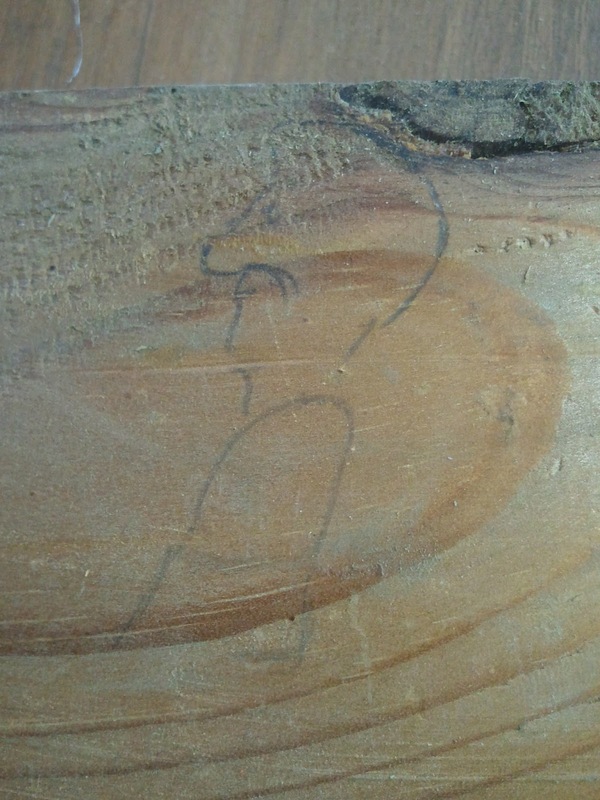 In addition, the piece was signed a second time, this time by a restorer. 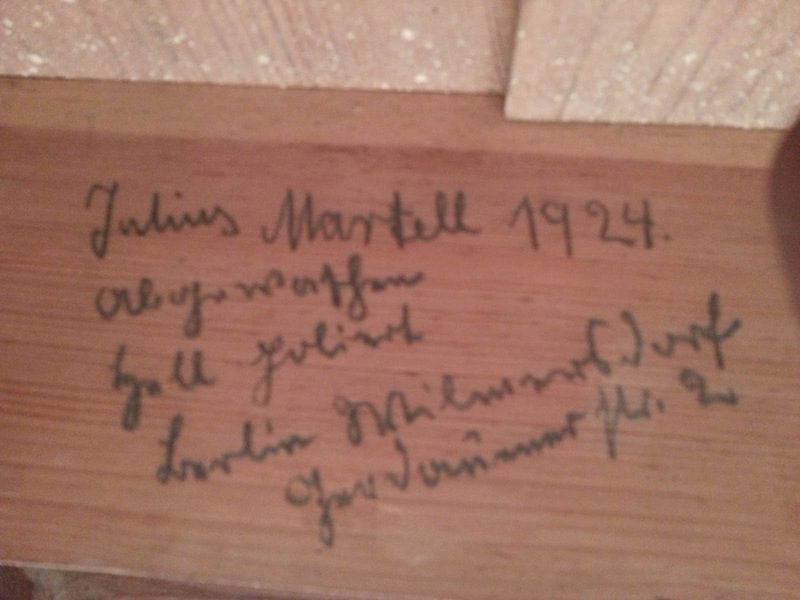 Julius (or Julian) Martell signed the piece in 1924. His inscription reads that the piece was lightly sanded and fully polished. It then lists the street address, presumably of his shop, in Wilmersdorf, a district of Berlin. Below is a photo of this signature. Many thanks to my neighbor who helped decipher and translate this writing. 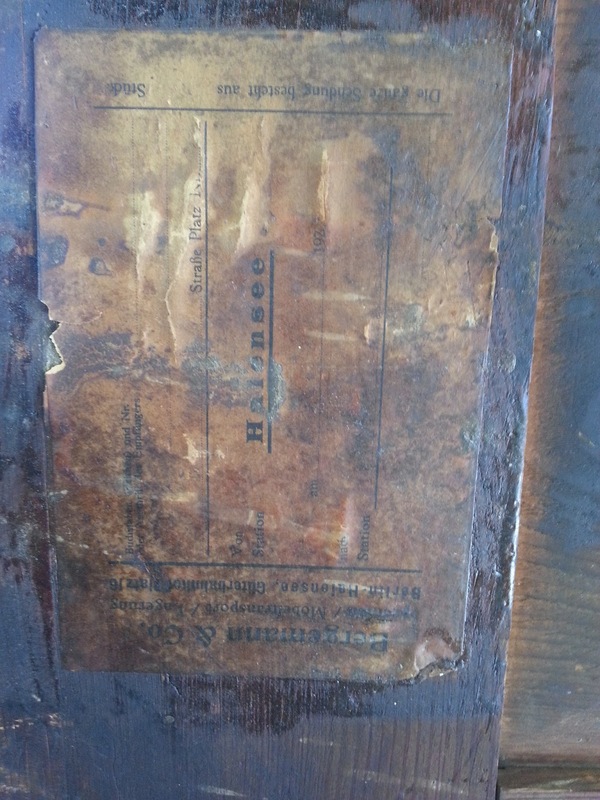 On the back of the case is a label for a moving company named Bergemann & Co. On the label is printed 192_. as well as the name Halensee, which is a district within the larger Wilmersdorf district. Here is a a photo of that label. From all of this it can be said that the piece was made by the cabinetmaker Müller, perhaps in Austria sometime around 1820. 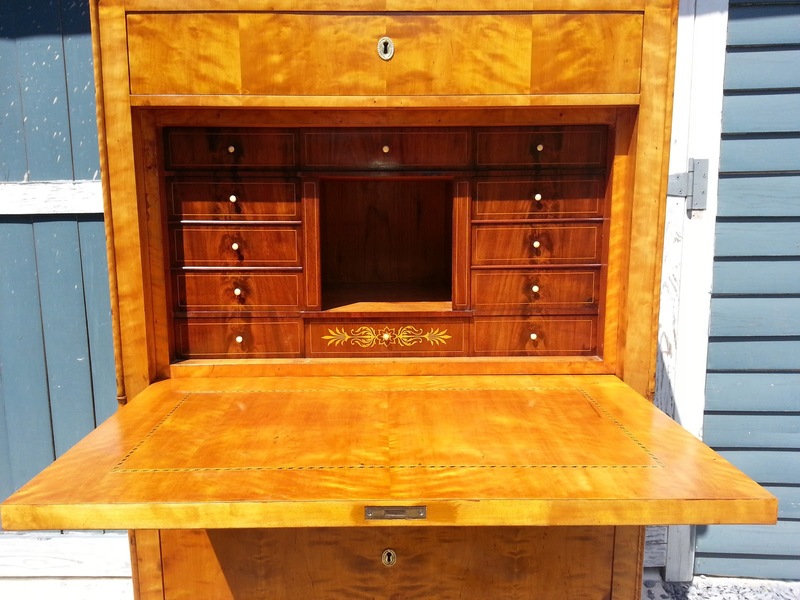 A century later, the desk was moved to Halensee, in Berlin, where it was restored by the Cabinetmaker Martell. There was evidence of work on the case that would support this theory. 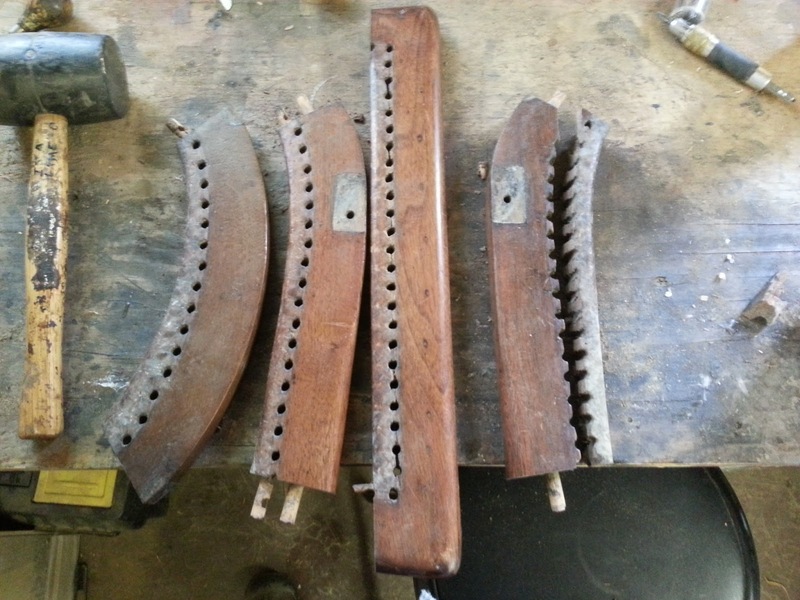 This may include the innapropriate feet, but those were fastened on by common nails which looked modern. They were probably put on by a subsequent restoration. 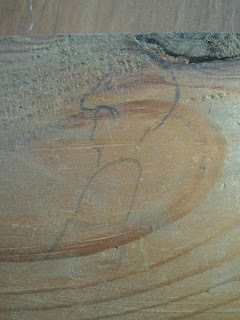 One other find was this wonderful drawing on one of the supports for the compartment drawers. Perhaps this is a self portrait of Müller or Martell. Whoever drew it, it was a happy discovery indeed! 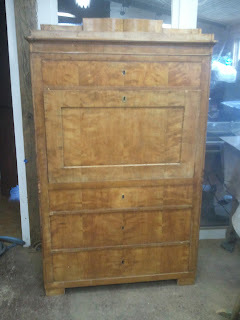 Below are photos of the drawers in various stages of repair. This includes gluing and replacement of veneer, as well as the addition of material to the drawer sides so that the drawers worked well. 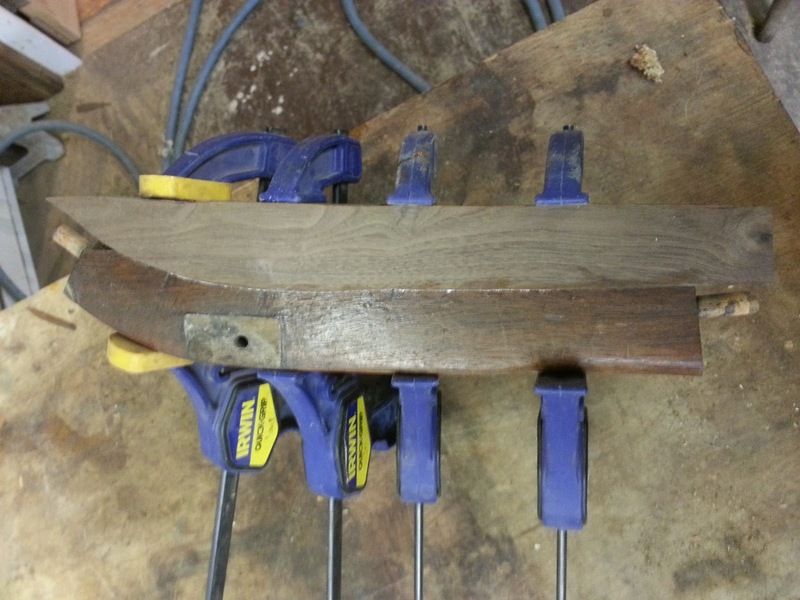 This photo shows a repair to the desk lid. It also shows the nice stringing that was inlayed into the writing surface. There were some imperfections in this stringing that led me to believe that it was made by Müller, and not purchased by a stinging maker, who would have had a more consistent product. 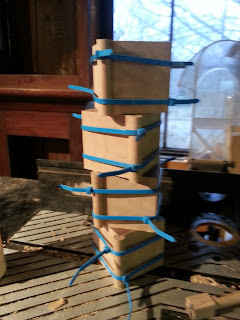 This is only a theory, and I could be wrong since the act of making stringing is very time consuming and was often purchased by from a specialist. This photo shows various repairs being made to the top corner of the desk. 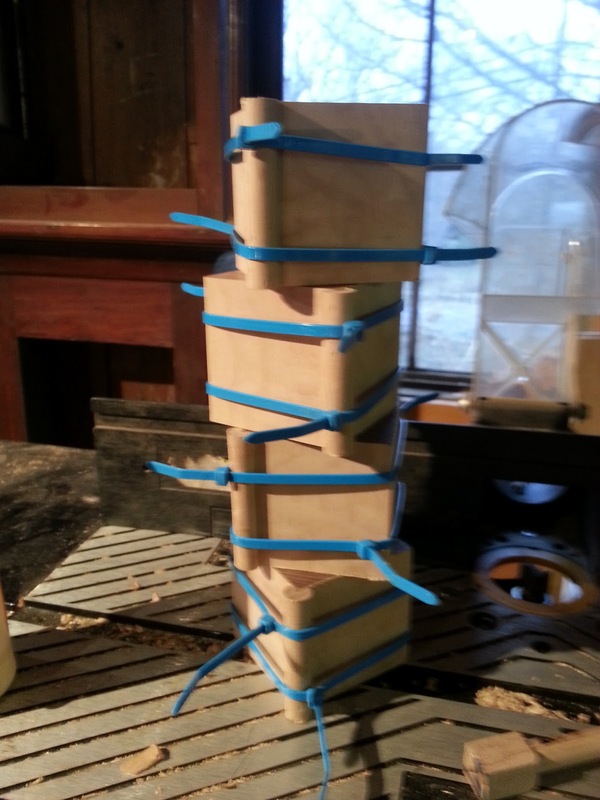 The top tiers have been removed in this photo because they were loose and also warped. This next photo shows the tiers being attached. 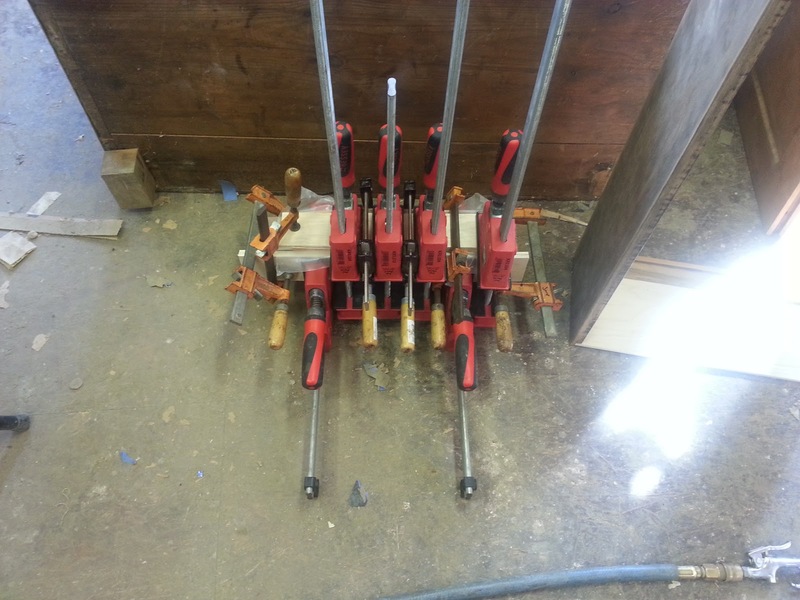 We used the old trick of pushing against the rafters to clamp them in place while the glue set. Don't try this at home! 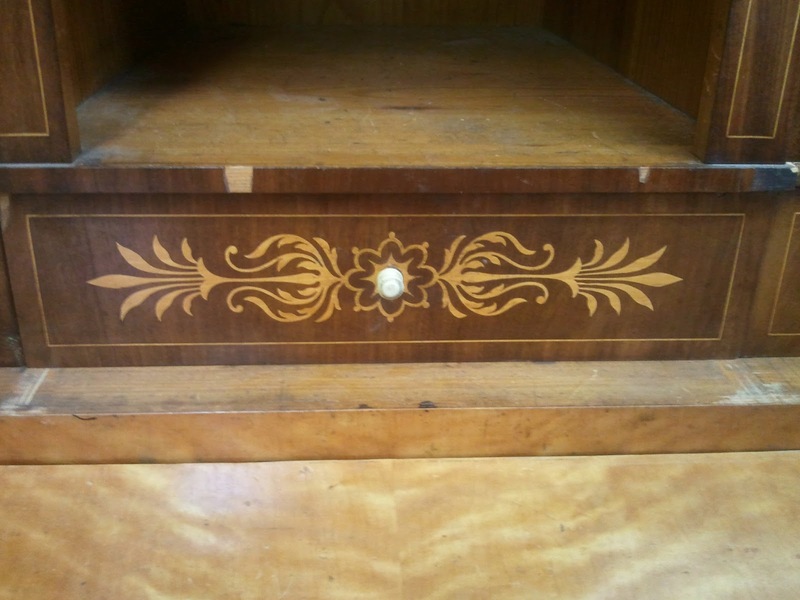 This photo shows the inner drawer compartment being repaired. The entire compartment was removable which led us to the discovery of the drawing of the little man. 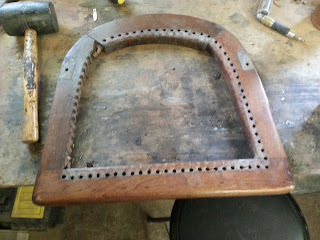 This photo shows the interior drawers being repaired. Once the old feet were removed from the case, the foot print of the originals was visible as a square. 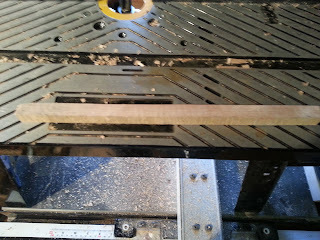 I measured this footprint and based the design for the new feet on this measurement. The footprint can be seen here. The feet that were on the desk were rectangular and the grain was oriented perpendicular to the grain of the veneer on the case. The feet were also made from solid Beech. All of this is inappropriate to the piece. After looking at many other examples, I decided that an appropriate foot would follow the outline of the original and be veneered in flame Birch, like the rest of the cabinet. 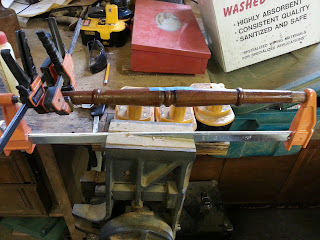 In addition, the 3/4 column turnings that run the length of the cabinet would be continued to the termination of the feet. 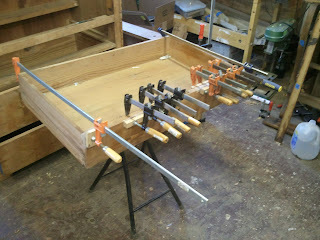 This would bring the feet in line with the rest of the piece. 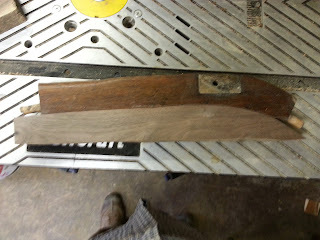 Below is a photo of the block that was used for the feet being veneered. 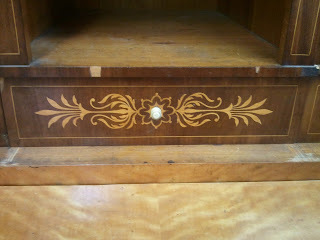 In the lower left of the cabinet you can see one of the old feet. 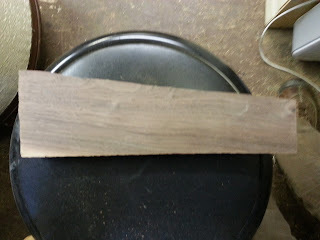 This photo shows the block after it was veneered. 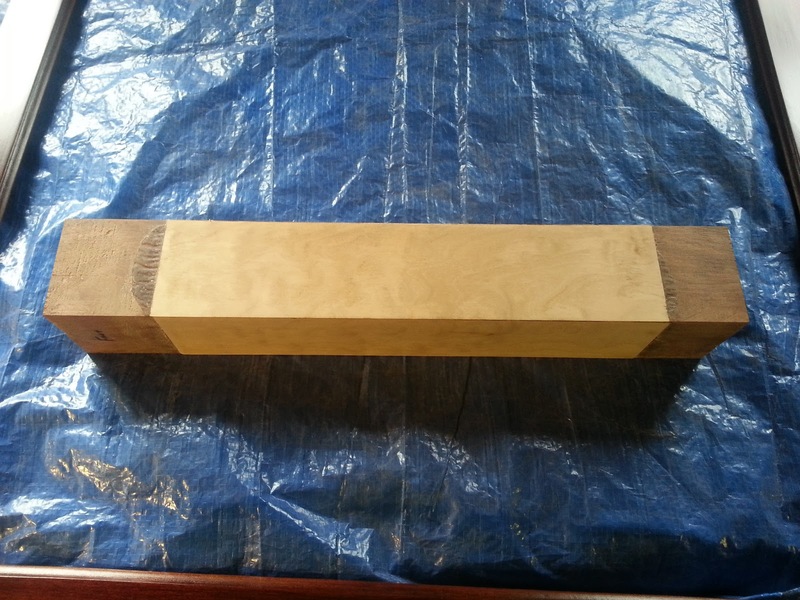 The block was then cut into four feet, as seen below. 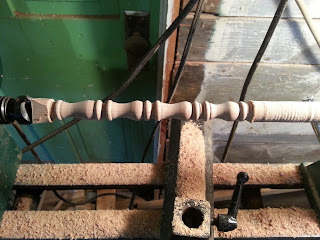 To make the 3/4 columns, I used a router to first cut the joinery for the column and then turned the cut piece on the lathe. The result looked like dowels with 1/4 of the material cut out. Below are a few photos of this process. 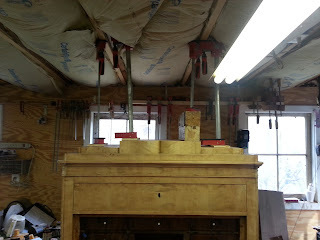 ( yes, those are zip ties holding the columns in place!). There were several spots along the columns that were also missing. These were in the same locations on either side and measured exactly half of the vase turnings displayed at the mid section on the piece. 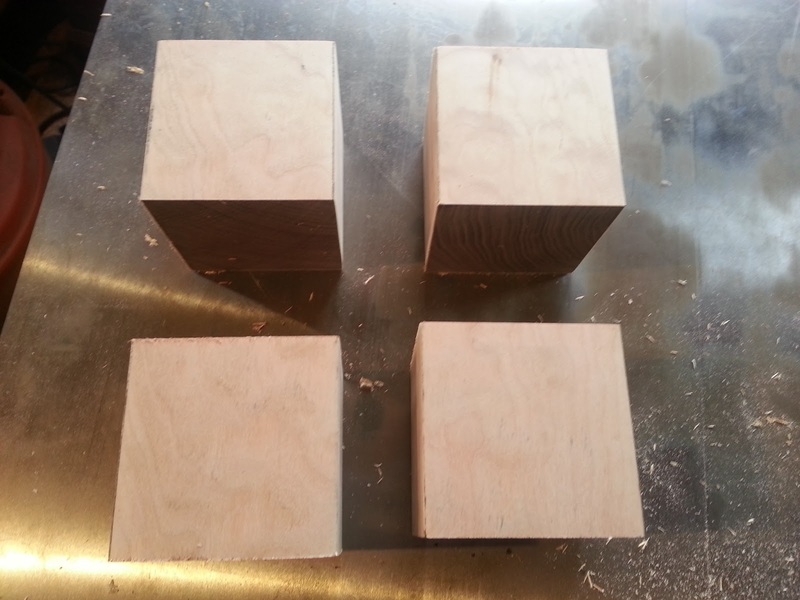 I decided to turn half vases that echoed the originals to fill these gaps. 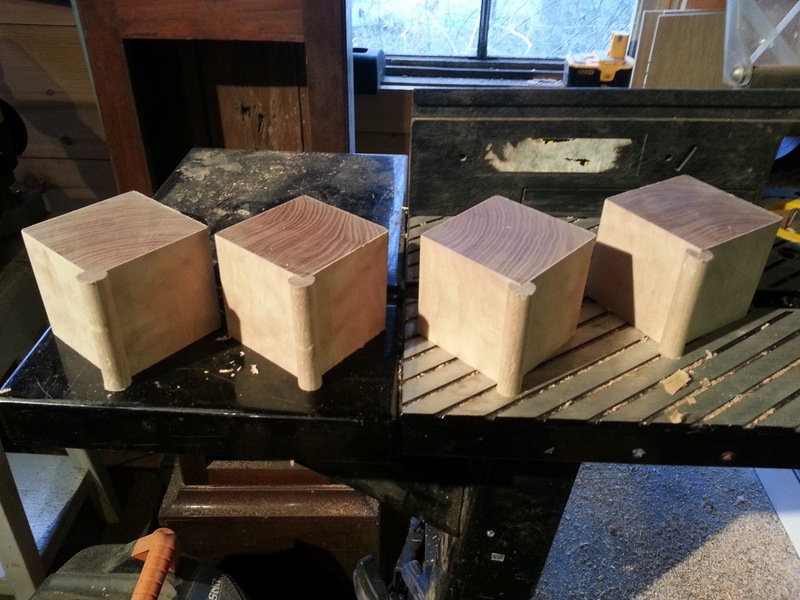 Below are photos of these vases being turned. 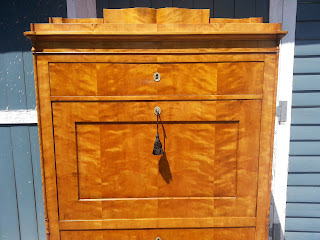 After all of the repairs were made to the case and it was sanded, a French Polish was applied to the case and the final step was to add a coat of paste wax. While I did some of the work on this piece, I would like to acknowledge Jesse Melton, who works with me, for the work he did on this piece. It really turned out well and I think that together we returned this fine desk to its proper condition. Below are a few photos of the desk in the shop followed by several of the desk outside, where the sun does a wonderful job of setting off the beautiful flame Birch veneer.